This November, Anthony and Katie were hosting a bonfire night party for their family, close friends and neighbours. The guests’ list had considerably grown in size since the couple were originally only going to invite their family and therefore, there were now too many people for Anthony and Katie to cater for, especially as they had to manage the fireworks and ensure everyone was entertained. Anthony came across Hog Roast Littlehampton a few years ago and had hired them to cook some delicious food for his brother’s surprise birthday party. However, for the couple’s firework display, most of their garden was being used to set up the firework display and firepits and so once filled with guests, there would be no room left over for the Hog Roast Littlehampton team to set up their stand. 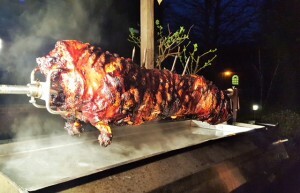 Yet, the Hog Roast team had a solution for the couple as Anthony found that they not only catered buffets for events but could cook a Hog Roast in advance and deliver it to your doorstep. This was perfect for the couple’s party and they ordered one straight away. Anthony set up the firework display on the lawn and ensured that the firepits dotted along the patio were roaring with life in order to keep the guests warm. Meanwhile, Katie made marshmallow skewers and set up a chocolate fountain for the guests for when they finished the buffet. The Hog Roast Littlehampton team delivered the hog just before the guests arrived so the couple had time to prepare it ready to serve from their own miniature buffet from the kitchen. All of the couple’s guests arrived soon after and dug straight into the Hog Roast Buffet. The couple were thrilled with the food, especially with how well the Hog Roast went down with their guests. In addition, the couple said that the meat was really tender and well-cooked and the team had managed to preserve it perfectly from the Hog Roast to their house. The couple ended the evening with their brilliant fireworks display at midnight, at which time the couple’s guests were said to be still sneaking back to the buffet for midnight snacks.